Designed by Christian Gobrecht, the Liberty Coronet Gold Eagle was an extremely long running series for the $10 gold denomination. The design was introduced in 1838 and amidst some periodic modifications, continued to be produced until 1907. The original obverse designed featured the head of Liberty facing left and wearing a cornet with the inscription of “Liberty”. There were an arrangement of thirteen stars surrounding with the date placed at the base. The reverse was based on the work of John Reich and featured an eagle with wings outstretched and talons grasping an olive branch and group of the arrows. The inscription surrounding reads “United States of America” with the denomination at the base. Over the coming years as the coins were produced at Philadelphia, San Francisco, and New Orleans, several design changes would take place. This included modification to the lettering and the inclusion of the motto “In God We Trust” on a banner above the eagle. After the motto was added, production also took place at Carson City and Denver. 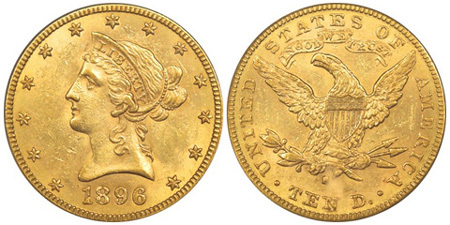 Mintage levels would vary widely over the course of the series, reaching the absolute low of just 100 pieces in 1875. Other issues during the same era experienced similarly low mintages. The series concluded when a new design known as the Indian Head Eagle was created by sculptor Augustus Saint Gaudens at the request of President Theodore Roosevelt.